Illegal Israeli colonialist settlers invaded, Friday, Palestinian olive orchards and grazing lands in the al-Farisiyya area in the West Bank’s Northern Plains. Human Rights activist Aref Daraghma said the colonists invaded the lands, located near the illegal Rotem colony, which was built on stolen Palestinian lands. He added that the colonists planted dozens of olive saplings in the grazing lands, which raised fears that they intend to illegally annex them to their colony. 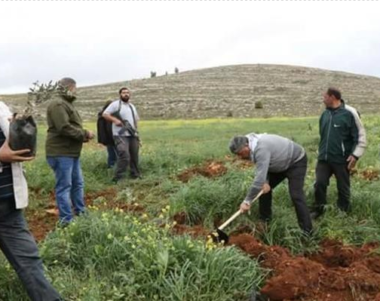 It is worth mentioning that the colonists usually invade and uproot Palestinian farmlands and orchards in the area, and several parts of the occupied West Bank, in addition to flooding other lands with wastewater mixed with chemicals. On Friday evening, Israeli soldiers invaded Nahhalin town, west of Bethlehem, and fired many gas bombs and concussion grenades in the town’s center.